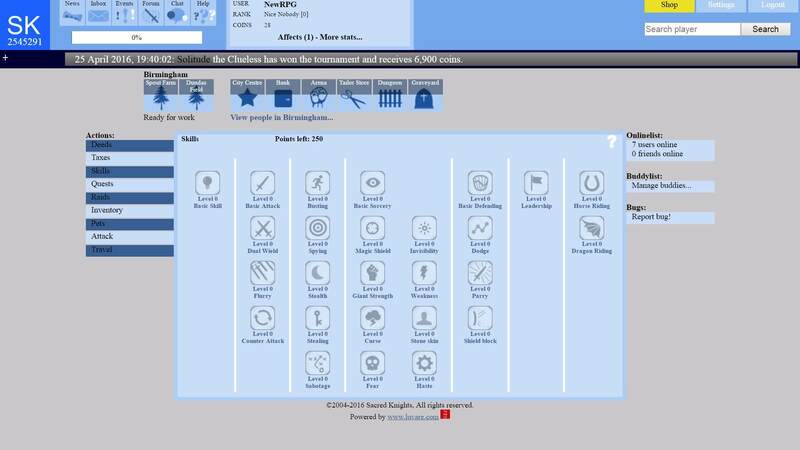 Sacred Knights is a text-based browser game with an opportunity to become a knight. Upgrade skills such as Flurry, Basic Defending, Invisibility, Fear, Magic Shield, Basic Attack and much more. Training attacking skill will increase your chances to hit the target. Accept random quests and complete them to earn rewards. You can select a pet for fighting and for travelling. Collect taxes to earn more coins. You can join a group or create your own raid group. Sacred Knights gives you the possibility to choose between the good and evil side. Attack the enemies and you could become the strongest knight. It’s a fkin facebook game?… christ.